Or "Heel Spurs". Do They Cause Pain? Why do they form? To summarize this article: Heel spurs do not cause pain! Many people who do not have heel pain, have a heel spur. There is no reason for a heel spur to cause pain, and many people have a heel spur without realizing it. Just because you have heel pain and a heel spur does not mean that the heel spur is causing your heel pain. Question: How does a heel spur develop?? Answer: First of all, a little bit of anatomy so you will understand what is going on. You have the plantar fascia which is on the bottom of the foot, and it connects directly to the heel bone. On the outside of this heel bone, you have something called the periosteum. The periosteum is a thin layer that covers the bone. The periosteum is very rich in "bone making cells" called osteoblasts. When the plantar fascia is under a lot of stress, it pulls off some of the "osteoblasts" from the bone and it becomes part of the plantar fascia. 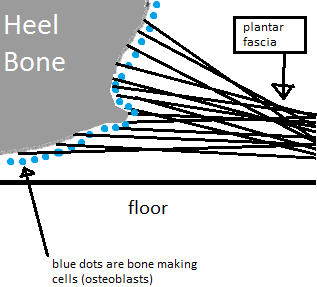 When these "bone making cells" are in the plantar fascia, they do what their job has always been to do, and they continue making bone. This creates a bump that is called a "heel spur" across the entire width of the bottom of the heel bone. ​Remember: Heel spurs are not "a mountain" they are a continuous "mountain range" kind of shape. It is a very long protrusion from one side of the heel bone to the other side. It is not a single "lump" in one spot (as so many people assume). 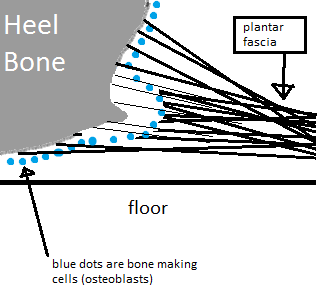 Look at how the blue dots (osteoblasts) got pulled off of the bone in the picture below. They are now in the plantar fascia. In this next step, the bone making cells continue to make bone wherever they are pulled too. They eventually form a lump called a heel spur. And the lump grows even more! Question: Ok I now understand how it forms, really simple. But what is bad or good about it? Does it cause pain? Answer: The good thing about heel spurs, is that it allows more surface area for the plantar fascia to attach to. This means that it is stronger and more easily able to heal in a sense. Bone is also very rich in blood, and it can theoretically supply the plantar fascia with more nutrients. Heel spurs do not cause pain. A large amount of our population already has heel spurs without pain at all. There is no reason it should cause pain. There is nothing that it is damaging about a heel spur. I know this is hard to believe and I am not a doctor, so take my word for it or please read this post made by a doctor from the mayo clinic: Click here to see the doctor's reason on why they do not cause pain. Question:But why does it look so painful? I saw the X-Ray and it's a huge bump sticking from my heel bone! Answer: The heel bone is rounded and the bottom is in the shape of a egg. When you see an x-ray of the heel spur, it may look like a sharp protrusion, but you must imagine now that from that angle it looks that way, when actually, it is more of a "shelf-like" protrusion. From the side view, it sticks out like a sharp bump, but from the front and back views, it looks like a flat ledge sticking out of the heel bone. The heel spur starts from the inside edge of the heel bone and does not end until it reaches the outside edge of the heel bone. 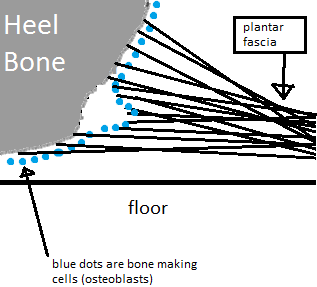 ​Long story short: it is not a "mountain" shape, it is a "mountain range" across the width of the heel bone. Question: Ok, so the heel spur is not causing my pain. What can I do to get rid of it though? If its not causing the pain, what is? Answer: If you have strong bones from eating a healthy diet, you can reduce the chances of getting a bone spur. When you have a high bone density, the osteoblasts cannot be pulled off the bones surface, and the bone keeps its shape. This is done through eating a diet with plenty of minerals and vitamin D/A/K2. Click here to learn more about these nutrients and my natural heel spur treatment. The pain is caused by inflammation that is present in the tissue surrounding the plantar fascia. Technically there is no inflammation in the plantar fascia, it is instead in a state of degeneration. These two things arise from weakness and a nutrient and waste exchange deficit which cause the area to become even weaker. When something is weak, it breaks. For information on how to fix this problem, check out my book by clicking here. Click here if you want to know my natural method for fixing heel spurs!